During fall, nighttime can be a time to explore and play. There is nothing like watching the stars or telling stories on a chilly night. Kids are also interested in exploring what they see in the nighttime. 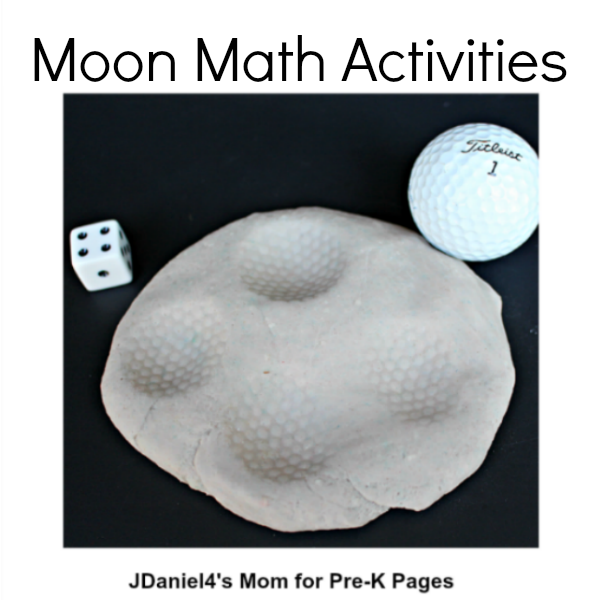 These moon math activities can be fun for a nighttime or space theme. Unlike the planets, the moon is something children have seen. They can look up in the sky and watch it wax larger and wane smaller. It is filled with craters. Children can sometimes see the way they make the moon look like it has gray spots on it. 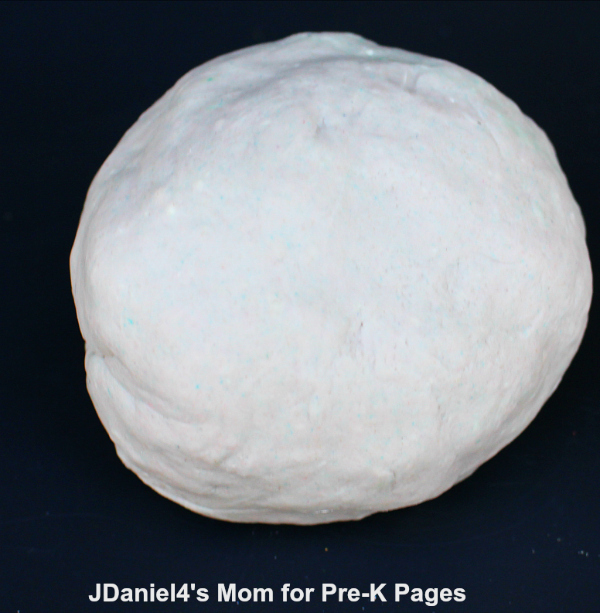 Children will enjoy creating their own spots or craters on moon-colored play dough. The craters they create could match a selected number. Play dough is so malleable that children can explore a number and then flatten out the craters and create new ones. *I wasn’t able to find store-bought gray play dough so I made homemade gray play dough. Add food coloring and boiling water. Stir until it becomes a sticky, combined dough. After it has cooled, knead the play dough into a ball. Encourage children to flatten the play dough with their hands or rolling pins. 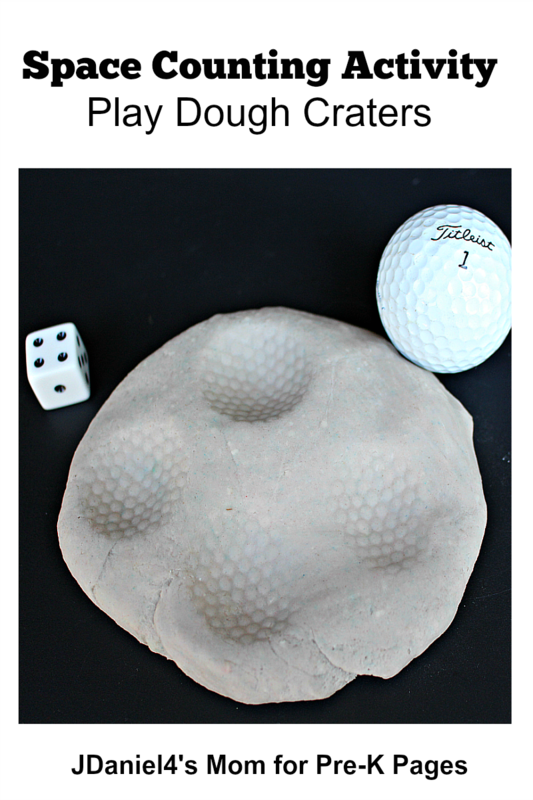 Demonstrate how to press the golf ball into the dough to create moon craters. 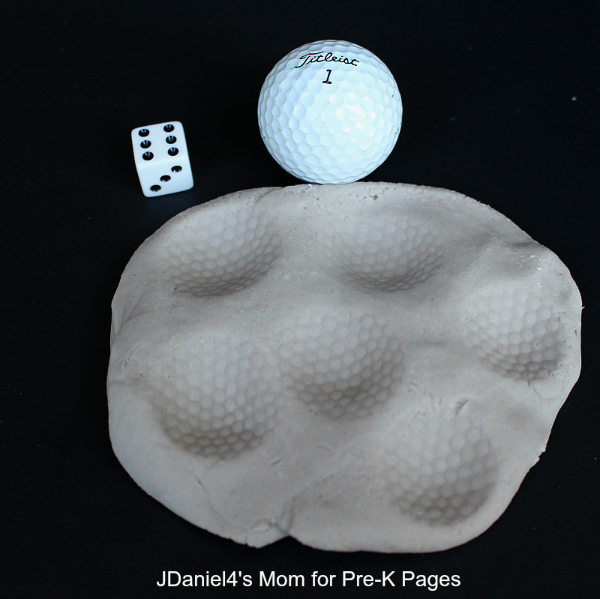 Encourage kids to experiment with the golf balls and play dough, discovering how to make craters. Some children may want to just experiment and may be uninterested in playing a game with the materials. Respect their choices. For those interested, introduce the numbered cube and play a fun math game with the materials. Invite a child to roll a cube and say the number on the top of the cube. 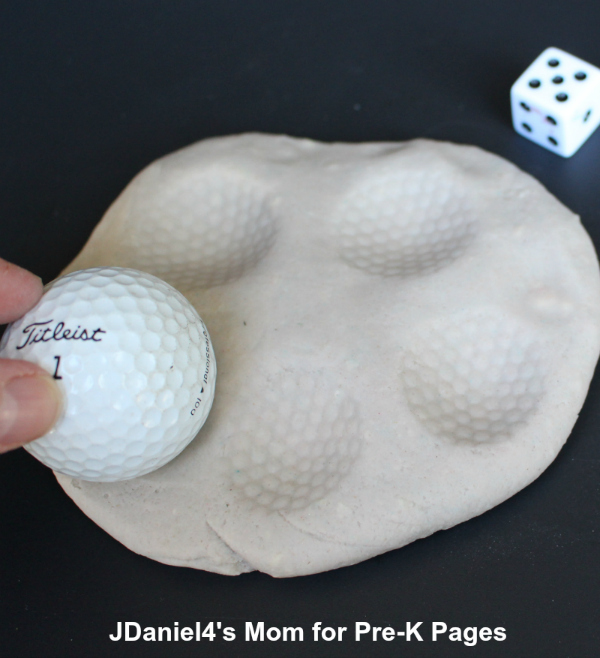 Lead kids to create that number of craters in the play dough with the golf ball. After counting the craters they have created, they will roll the play dough into a ball. Then they roll the cube again and create a new set of craters. Your children may develop other games using the cubes, golf balls, and play dough. Encourage counting and recognizing groups of numbers. I like the idea of including play dough in math activities, it will definitely draw the kids in. I find I sometimes have a hard time thinking up fun math activities, I’ll definitely add this to my to do list of math activities!